Feel Bach! flower remedies blog: Are You as Indecisive as the Month of March? March weather – one day it looks like Spring and the next day Winter is back. Although this is normal during the transition between seasons, it really does look like Mother Nature can't make up her mind. That got me thinking of all the people who also can't make up their minds. For some, indecision is a barrier to moving forward in life. They can't decide whether to go to school, get married, take a new job, or move to a different community. Those big decisions do require some thought, and those who can't make up their minds could be helped along during these life-changing moments by using Scleranthus. Scleranthus is the Flower Essence that treats indecision. It helps people at transition points in life, and also helps those who suffer from living in a state in which they can't make even small decisions. In the chronic negative Scleranthus state, a sufferer will agree to a course of action one day, only to come back the next and try to get out of going forward with it. Even decisions about which shirt to wear, what to cook for dinner, or which movie to see turn into major problems. Scleranthus personalities also exhibit a variety of physical ailments - all opposite to one another. They suffer from hot flashes, then they suffer from not being able to get warm. They may also exhibit the classic symptoms of manic-depression. They're happy and enthusiastic one day, and completely apathetic the next. Interestingly, once Scleranthus personalities get into balance through the use of Dr. Bach's Flower Essences, they become confident decision makers and their presence is soothing to others. 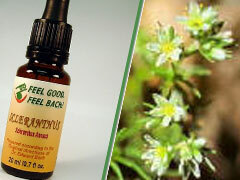 Visit Bach Flower.org to learn more about Scleranthus and other Flower Essences.